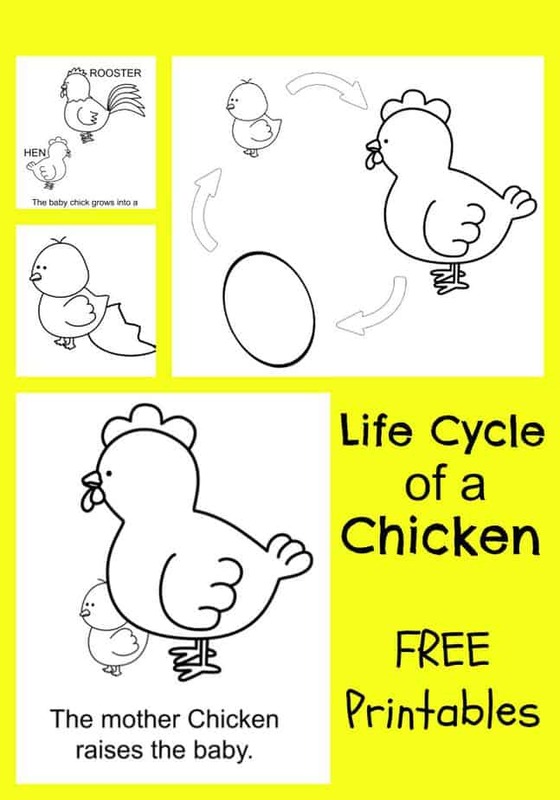 Life cycles are some of my favorite science lessons to teach kids simply because of how excited they get watching their favorite animals change forms! 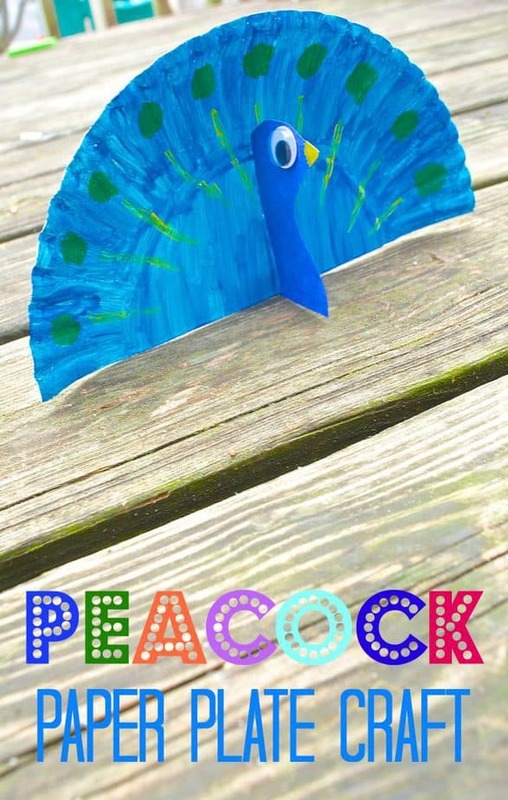 Plus these make fun life cycle snack ideas and crafts for kids to keep them busy too! 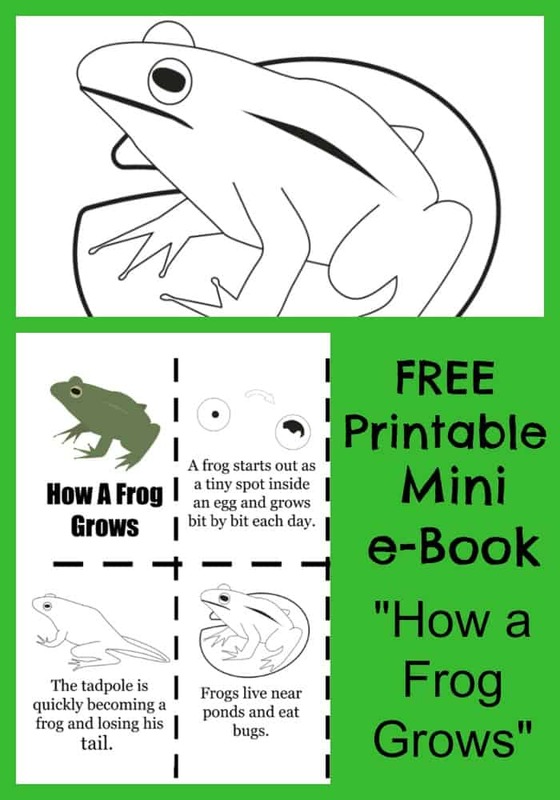 I’ve provided quite a few free life cycle printable coloring books on this blog (frog, chicken, apples, bat) but it’s been a while since I covered a life cycle craft or activity for kids. 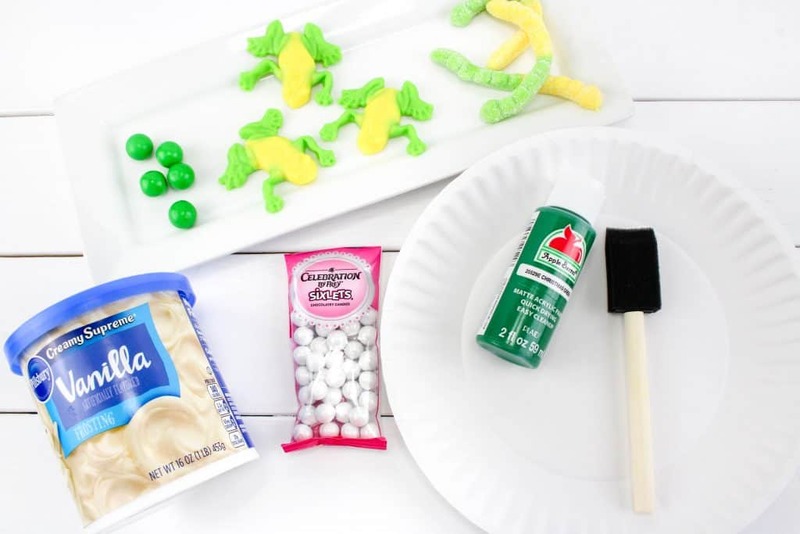 Below you can find the step by step directions on how to make this Frog Life Cycle Snack idea for kids! Because you have to “build” your tadpole and froglet it reinforces each phase of the frog’s life. 2. 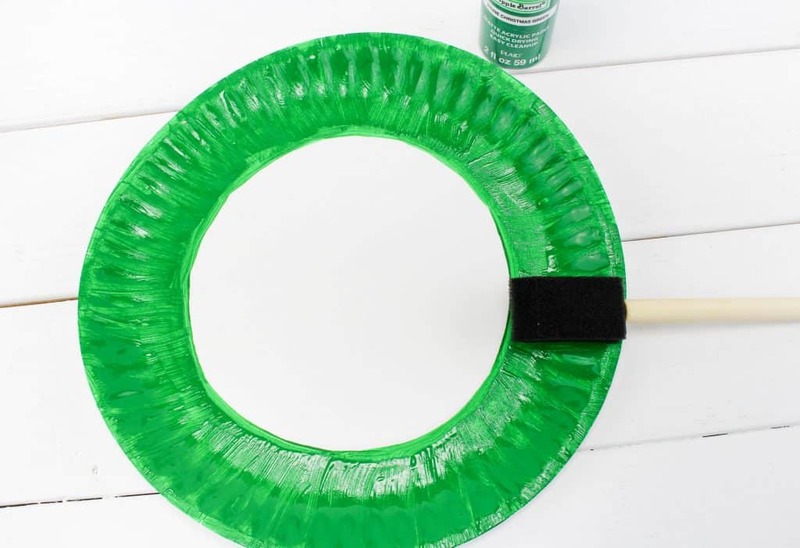 To make the tadpole, cut a gummy worm in half for the tail and stick the on the end. 3. 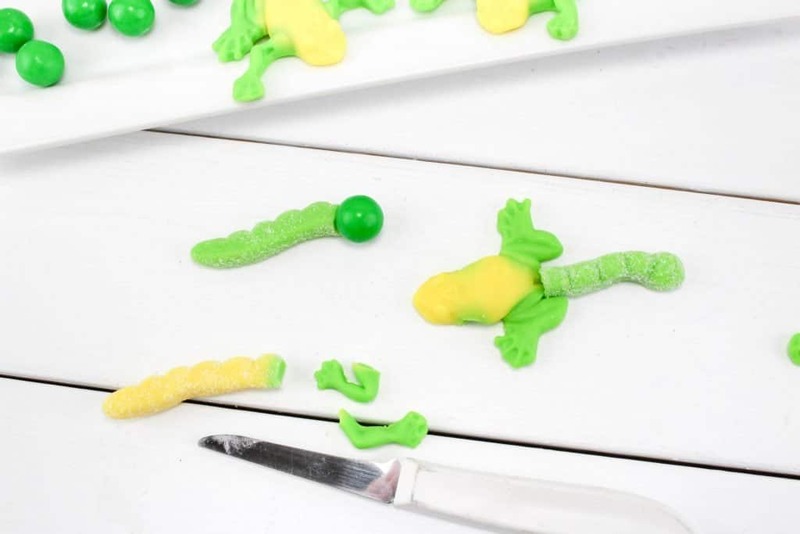 To make the froglet, cut the front legs off a frog gummy and stick a half of gummy worm on the back end of it for the tail. 4. 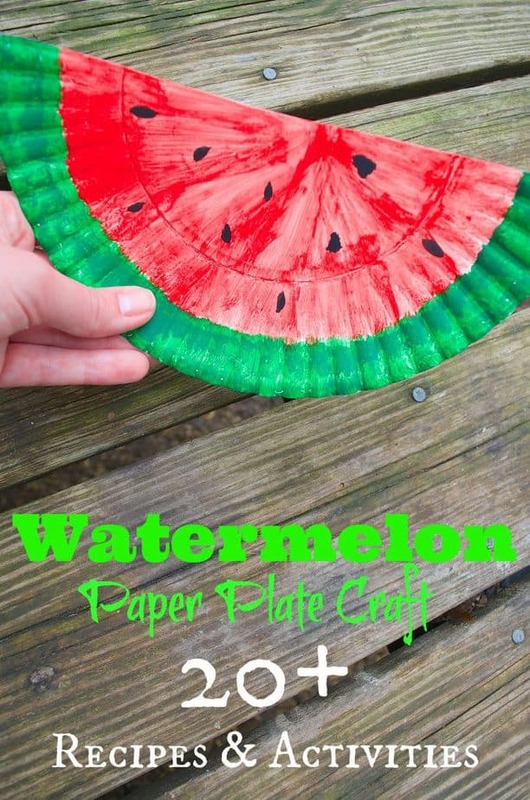 Use a black marker and draw 2 lines on the white circle on the plate so it splits the plate into even fourths. 5. 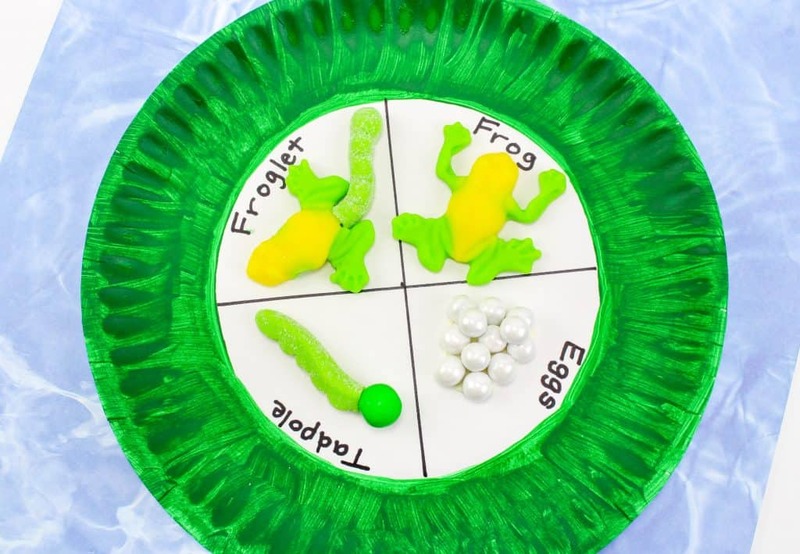 In each section of the plate write one word each: Eggs, Tadpole, Froglet, Frog. 6. 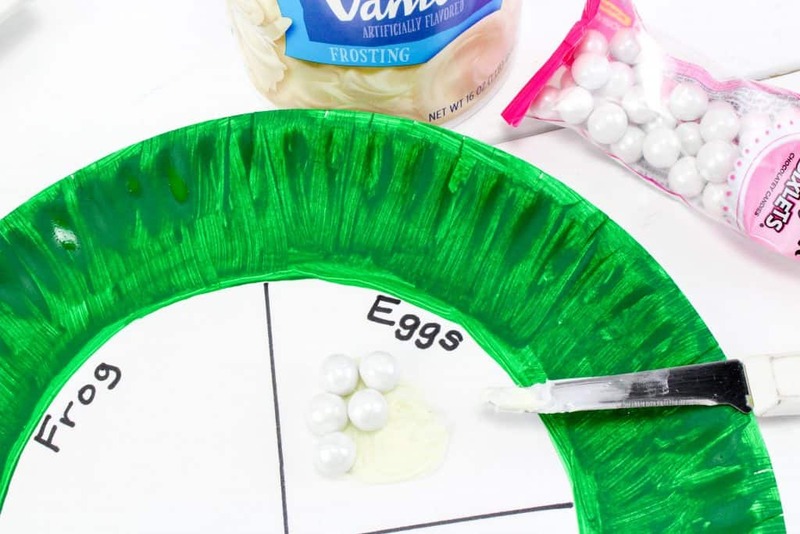 In the Egg section, put a dollop of frosting on the plate, and stick a little pile of white candy all over it. 7. 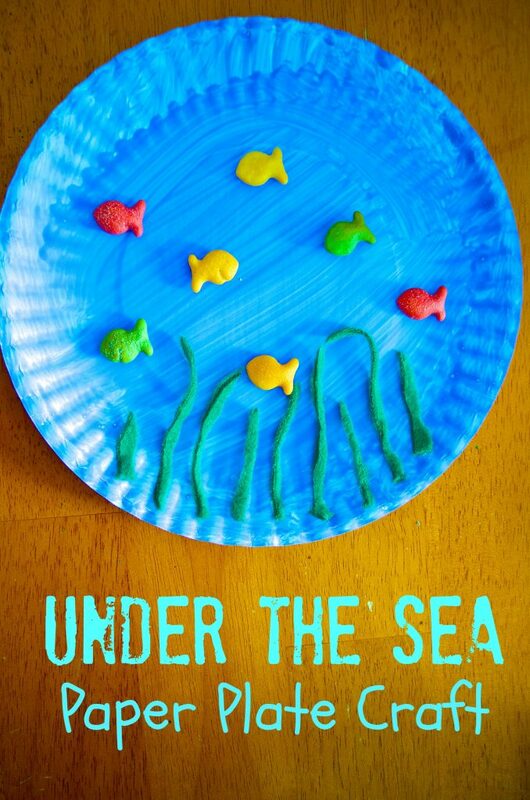 In the Tadpole section, put a little dot of frosting and stick the tadpole on. 8. In the Froglet section, put a little dot of frosting and stick the froglet on. 9. In the Frog section, put a little dot of frosting and stick a whole frog on. WHOO! You officially have an AWESOME (and yummy!) frog life cycle treat to eat now! That’s the best part!! 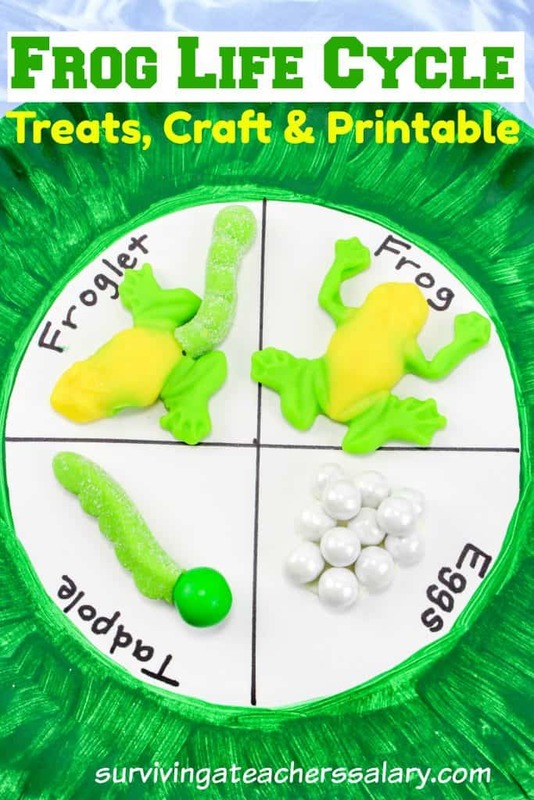 Personally there are two frog life cycles “manipulatives” that I like to use depending on the age group. 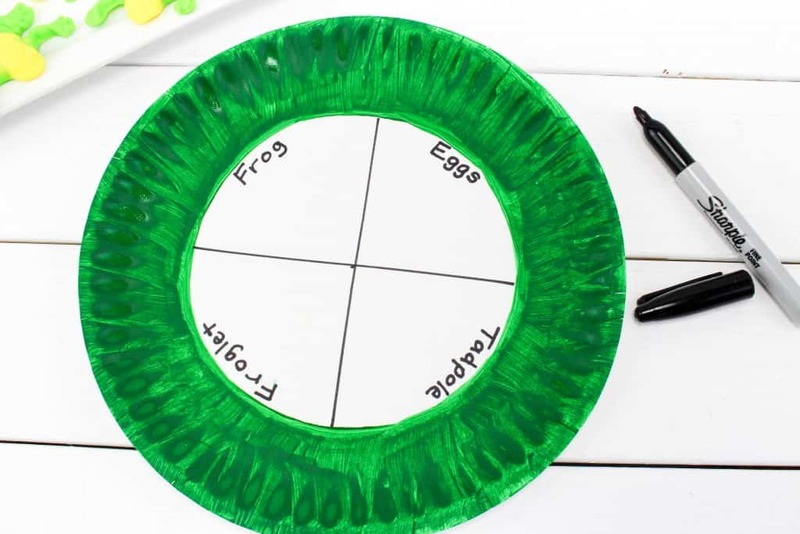 One is this GIANT frog life cycle magnet set that you can use on the whiteboard or refrigerator. 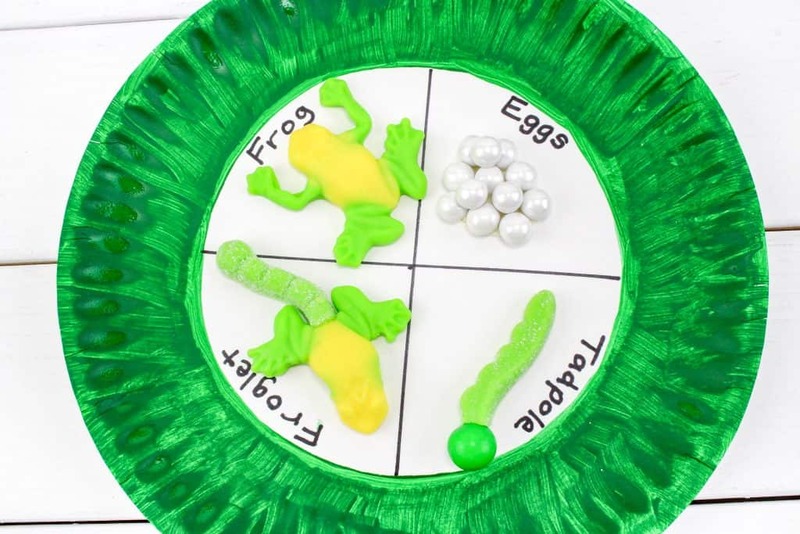 The other is this frog life cycle figurine set that kids can touch and even use in sensory bins. 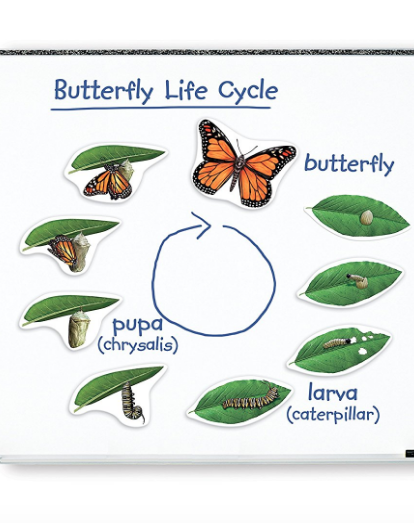 Check out some of our other Life Cycle Resources below!